Ninos Du Brasil - Animais Soar O Alarme. Vinyl 12. Bleep. Insane record here. 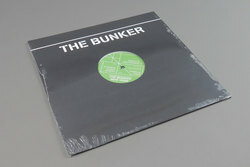 The ritualistic, percussive frenzy that the Ninos crew represent has been well documented on Hospital, Tannen and even La Tempesta super recently, but with their sound perfectly suited to the dancefloor it’s no suprise a 12” has appeared so soon after that last album. Debuting here on The Bunker they provide another no-nonsense drum workout that comes with an exclusive remix from Bunker DJ Patrick Russell.